New: non-magnetic lithium polymer rechargeable cells. Occasionally there is a need for batteries that are non-magnetic. Our research into this area has turned up the lithium metal manganese dioxide cells as a possibility. There is some paramagnetism in the manganese dioxide, since it has 3 unpaired electrons, but the main source of ferromagnetism is the case. These cells use non-magnetic stainless steel due to the chemical properties of the steel. However, non-magnetic stainless is only non-magnetic if it is properly annealed. When the annealed steel sheet is drawn to form the case the crystal structure is disrupted and it becomes slightly ferromagnetic. This means that our CR series cells have far less ferromagnetism than other steel-cased cells, but it also means that if you have a strong enough magnet they will be attracted to it. These pseudo-non-magnetic cells have been found useful in many areas, but they are not good enough for others. 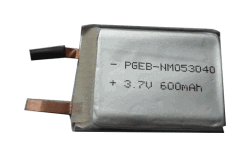 Another option is the lithium thionyl chloride 3.6V cells. They use the same stainless steel as the maganese dioxide cells, but they do have a center rod that is glass-frit sealed into the top. In order to make a good seal with the glass the rod is made out of Kovar, an Ni-Co-Fe alloy that is very magnetic, though it weighs less than a gram in most cells. The key is in testing the battery in your application, not necessarily testing them with a Nd-B magnet.